Iran has expressed hopes that the Saudis stop their narrow-minded policies and start helping with the fight to rid the region of Takfiri terrorism. 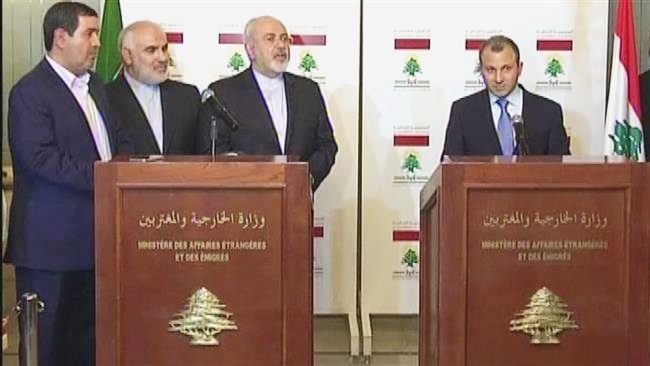 Iranian Foreign Minister Mohammad Javad Zarif made the remark during a joint press conference with his Lebanese counterpart Gebran Bassil in Beirut on Monday. “We hope that the Saudi authorities swiftly put away their narrow-minded policies and help to put out the fire of Takfiri terrorism in this region,” he said. Zarif also noted that apart from similar challenges, Iran and Lebanon share common opportunities, one of which being economic cooperation during the new international conditions. “The presence of a high-ranking Iranian economic committee in Beirut shows the serious determination of Iran’s private and government sectors for cooperation with the people of Lebanon towards creating a better tomorrow,” he said. He also hailed Lebanon for finally resolving its two-year-plus political impasse by the election of President Michel Aoun, and stressed that Iran would be happy to receive him at anytime if he wishes to visit Iran. Earlier in the day, Zarif held a meeting with Aoun. He is also set to meet with Lebanese Parliament Speaker Nabih Berri, Caretaker Prime Minister Tammam Salam, and Prime Minister-designate Saad Hariri.